Lledo is now over ten years old, and its wonderful products are numerous and interesting enough to fill a wonderful new book by America's foremost authority. 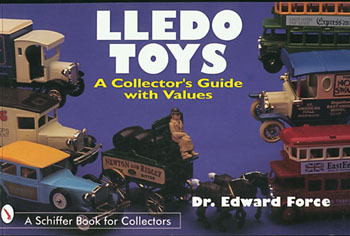 Matchbox Toy co-founder Jack Odell founded the Lledo Company (his name spelled backwards) and produced the first models in 1983. Since then, the fleet of these miniature antique vehicles has grown to include thousands of examples, including basic models and great number that carry company advertising designed for promotions.Over 2000 examples photographed in full color document the production of Lledo. In addition, Ed Force gives an informative history, an extensive list of variations, and a price guide to current values.Included are Days Gone models, buses, emergency vehicles, newspaper vans, beer and soft drink trucks, food product vehicles...the list goes on and on. This new book will be a welcome and necessary part of any toy-related collection and will be enjoyed by all.